Honda Fit Service & Repair - A+ Japanese Auto Repair, Inc.
A+ Japanese Auto Repair has been servicing and repairing this reliable compact vehicle since it arrived in the United States in 2006. We have most parts in stock and are able to service your vehicle today. The Honda Fit has seen many changes over the years. 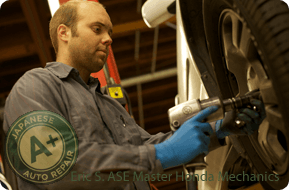 When it comes to repairing the Honda Fit A+ Japanese Auto Repair is known as the Bay Area's Experts. If you have any repair needs contact us or set up an appointment today. The Honda Fit debuted in June 2001 in Japan and immediately became a big hit. By December 2001, it had outsold the Toyota Corolla, and ranked first in sales for nine out of twelve months in 2002. Honda originally intended to name the car "Fitta," but shortened the name in some markets, and renamed it completely in others, upon discovering that in several Nordic languages, “fitta” is a popular and vulgar slang word for female genitalia. Introduced a few years ago just as gas prices were beginning to race skyward, the Honda Fit now looks like a happy little piece of automotive prophecy. A subcompact four-door hatchback, the Honda Fit has earned praise for its world-class engineering and design, and it has definitely found its niche with consumers, particularly with the arrival of the second-generation model. The Fit is Honda's smallest automotive product, but it nearly matches the total passenger space of the larger Civic sedan. A production model for the United States and Canada was introduced in January, 2006 at the North American International Auto Show in Detroit. The car was released in Canada and in the U.S. in April, 2006 as a 2007 model year car. Since then, the Fit has been the quintessential Honda: fun to drive, astonishingly versatile and made well enough to make you forget that you were driving one of the least expensive cars on the road. If it turns out you need a professional to repair your vehicle, please contact us. At A+ Japanese Auto Repair, we look forward to providing the highest level of automotive service and customer satisfaction. Our technicians have become experts at diagnosing, repairing, and servicing Honda Fit Vehicles. Even the most well maintained automobile occasionally needs professional help. A+ Japanese Auto Repair has been servicing and repairing this reliable compact SUV since 1997, and we are known as the Bay Area’s experts.